If you're planning a relocation within New Jersey, let Booth Movers help you handle all the details of an intrastate relocation! Our BBB-accredited New Jersey intrastate moving company has the experience needed to make your next move a seamless experience. Since the 1940’s, our Bergen County intrastate movers have been building a reputation of quality and exceptional customer care within the industry. As proud members of the American Moving & Storage Association and the New Jersey Warehousemen & Movers Association, our ProMover-certified business is committed to providing the best in New Jersey intrastate moving services. As a trusted agent of the reputable Atlas Van Lines, Booth Movers is connected to a nationwide network of moving and storage professionals that have the equipment and expertise to complete household relocations of any size. To begin the process of your New Jersey interstate move, one of our qualified team members will come to your home and provide a free, in-home estimate of your moving costs. Honesty and quality are integral to our New Jersey intrastate moving company, and when working with Booth Movers you can rest assured that each stage of your relocation will be handled with the highest level of professionalism. Whether you need help moving an apartment or a large family estate, there is no job too big or small for our expert New Jersey intrastate movers! With our wide variety of moving and storage solutions, we offer services that can be customized for any move plan or budget. Apartment Moving – For apartments big or small, there is no better choice than our experienced New Jersey intrastate movers for your next relocation! Senior Moving – Care and compassion are at the forefront of our senior moving services when we help your loved ones with their next move. Household Moving – As the industry leader in household moves since 1945, Booth Movers offers customizable New Jersey intrastate moving services. Full Service Moving – Our New Jersey intrastate movers have experience in every area of relocation, including full-service packing and specialized transport of your high-value items. 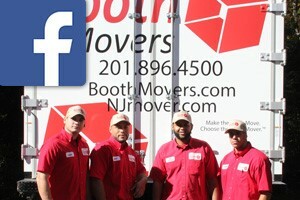 Are you ready to learn more about what Booth Movers offers in New Jersey intrastate moving services? Just give us a call today! You can also fill out our online quote form to request your free, no-obligation moving estimate!